(Berlin. 09.12.13) The NGO Campaign, Facing Finance, presents their latest report, DIRTY PROFITS 2, to commemorate International Human Rights Day, (10.12.) in Berlin. This report demonstrates that human rights violations, corruption, exploitation, and environmental destruction remain ingrained in the business models of major multinational corporations. The robust, 124-page report presents the most serious violations of international norms and standards committed by 26 multinational companies, (including SHELL, GAZPROM, GLENCORE, NESTLÉ and ADIDAS). The companies examined in this report grossed more than 1.24 trillion Euros in 2012 and earned profits in excess of 90 billion Euros. “A not insignificant portion of multinational profits are derived, now as much as ever, from openly controversial practices that violate people and the environment,” laments Thomas Küchenmeister, coordinator and initiator of the Facing Finance Campaign. He goes on to criticize the inadequacy of international tax laws, saying, “The fact that multinationals are also circumventing tax laws adds to the unjustness, despite the practice being largely legal.” According to the European Commission, the EU loses around 1 trillion Euros every year due to tax evasion and/or avoidance maneuvers. Based on financial analyses conducted by the economic research consultants at Profundo, the DIRTY PROFITS report reveals the European financial institutions that financially support such controversial operations. Many companies, like Gazprom, Shell, Nestlé, and GlencoreXstrata, depend on financial support from financial institutions for their controversial projects. Between 2011 and 2013, financial institutions invested nearly 33 billion Euros into the 26 companies analyzed in the DIRTY PROFITS 2 report. Through their financial transactions with these companies, (e.g. providing payday loans, assisting in share/bond issuances, etc.) financial institutions take on responsibility for the environmental and social consequences of their clients’ actions. Overall, BNP Paribas, Deutsche Bank and Credit Suisse contributed the most towards controversial companies; they support the vast majority of controversial companies that other internationally accredited investors, (e.g. the European Investment Bank, and the Norwegian Pension Fund), have chosen to exclude (17 of the 26 analyzed companies) from their investment portfolios due to their severe environmental/social impacts. “Through their noncritical financial injections towards polluters and human rights violators such as Gazprom or Glencore, financial institutions support the illegal plundering of resources, human rights abuses, and global warming,” said Barbara Happe from the human rights and environmental organization, urgewald. This demonstrates that the voluntary commitments adopted by financial institutions fail to safeguard environmentally and socially unsustainable investments. Recently, international attention has focused on the Russian energy giant, Gazprom, which has a reputation for corruption and anti-competitive practices. The Russian coast guard arrested several Greenpeace activists this summer during a peaceful demonstration against Arctic oil drilling at the Prirazlomnaya oil platform. The activists were detained for more than two months before they were eligible for release on bail. They currently stand charged of hooliganism. Investments in Gazprom by European banks, led by BNP Paribas, ING, Unicredit, Deutsche Bank and Commerzbank, totaled €3.4 billion during the investigation period. 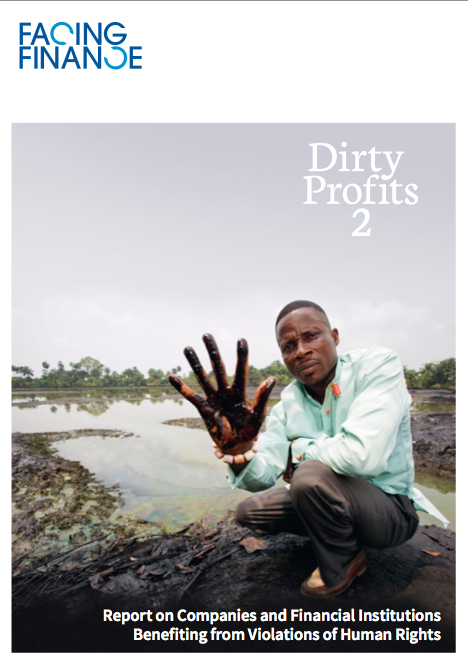 Dirty Profits 2 calls on financial institutions to incorporate international human rights and environmental standards into binding financial service regulations that exert influence on companies to comply with these standards. Furthermore, lawmakers must immediately take steps to end the financing of controversial sectors, (e.g., nuclear weapons and cluster munitions). Also, tax benefits for pension (“Riester”) funds, should be limited to financial products that meet sustainability standards. Certification of such retirement, or “Riester,” products, needs to be monitored by an ethics committee; civil society further calls on bank customers to scrutinize their bank’s business practices and, if necessary, change their financial service provider.